A coffee like no other. Loved like no other. Starbucks Tribute Blend® is back. Created to celebrate our 40th anniversary, this coffee captures the essence of our history and was designed as a tribute to our loyal customers and partners and the accomplishments of our coffee producers and roasters. 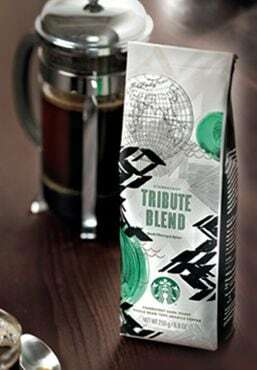 Starbucks Tribute Blend® combines four of our all-time favorite coffees: Ethiopian sun-dried beans with an exotic flourish of dark cherry; Aged Sumatra, loved for its syrupy body and cedary spice notes; juicy herbal and complex coffees from Papua New Guinea; and our Colombia coffee, bright, balanced and nutty. It’s a delicious blend, perfect for sharing with friends and neighbors, and our way of honoring the communities we live and work in each day. Outrageous Oatmeal Cookies and a long-time friend.